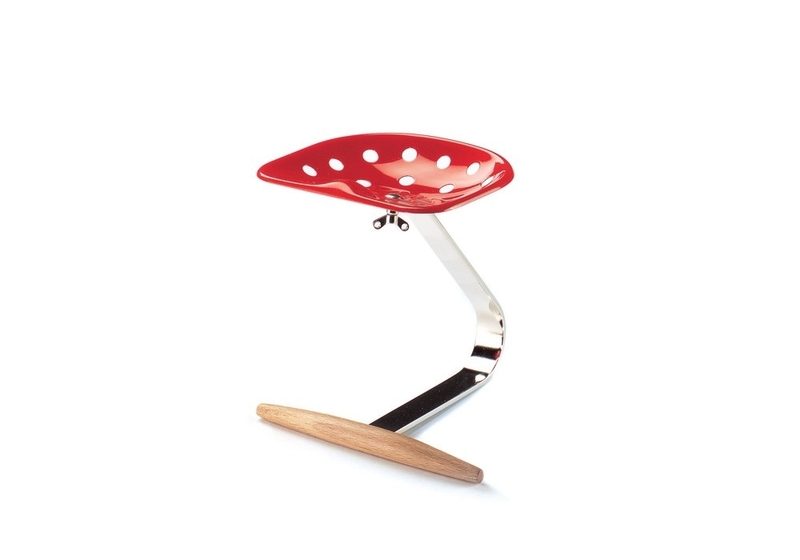 Vitra Miniature Mezzadro, Castiglioni: On the occasion of the XIth Milan Triennial in 1957, Achille and Pier Giacomo Castiglioni presented their first prototype for the Mezzadro. The stool went on show in its current form that same year in aninterior setting displayed at the »Colori e forme nella casa d’oggi« exhibition in the Villa Olmo in Como. 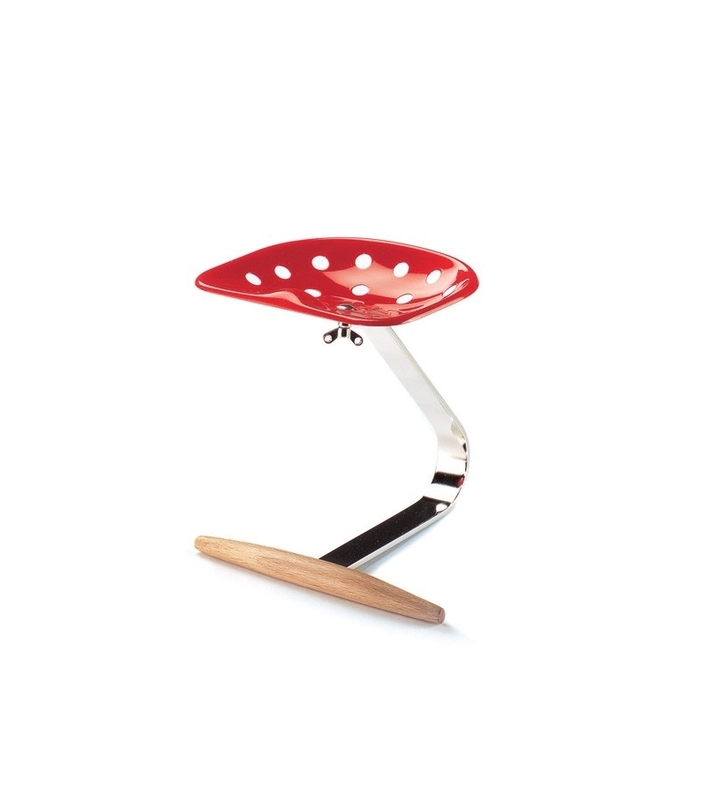 Vitra Miniature Mezzadro, Castiglioni: On the occasion of the XIth Milan Triennial in 1957, Achille and Pier Giacomo Castiglioni presented their first prototype for the Mezzadro. The stool went on show in its current form that same year in aninterior setting displayed at the »Colori e forme nella casa d’oggi« exhibition in the Villa Olmo in Como. The designers used a common tractor seat for the springy metal seat, fastening it with a wing nut to the spring-based arched steel strip utilized in tractors to absorb the shock of uneven ground. They enhanced the stability of the cantilever structure by a wooden cross-strut that resembled the rungs of a wooden ladder. Each of these parts clearly embodies its task as a part of a functionalwhole. And what strikes the eye is the recourse to an artistic method exemplified by Marcel Duchamp’s found objects or Pablo Picasso’s assemblages. The Castiglionis considered a design successful only once they had managed to eliminate all the unnecessary components andan optimal formal expression had been found for this concentration on the essential. 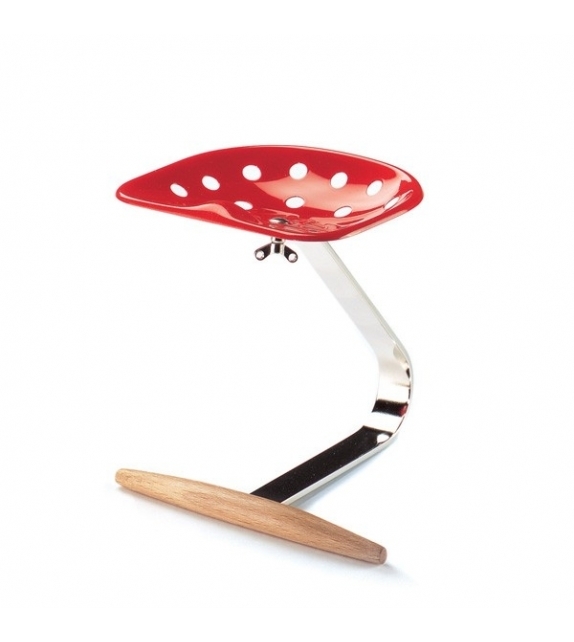 Steel, chrome-plated and lacquered, beech wood.